Over the last week we’ve been citing Frye on religious fundamentalism and false literalism. 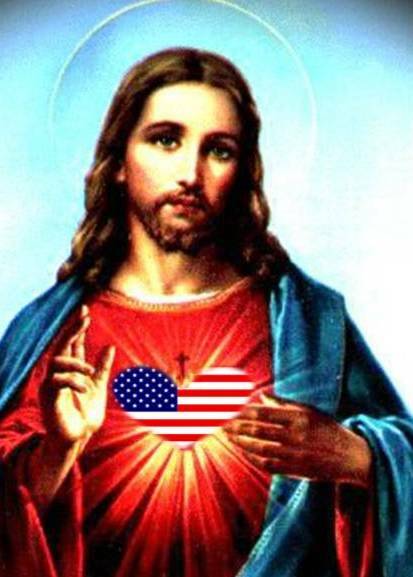 This week we’re turning our attention to the affinity of the Christian right and laissez faire capitalism. That affinity is confirmed by a Religious News Service poll published in April. According to the poll, 36 percent of Christians say capitalism and the free market are consistent with Christian values; 44 percent say the two are at odds. However, party affiliation significantly influences this view. 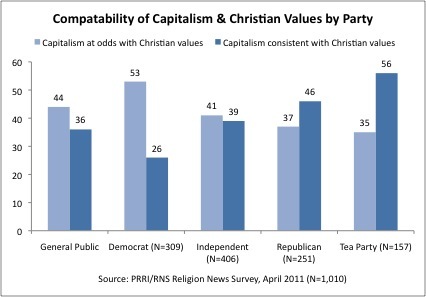 Among Democrats, only 26 percent say Christian values and capitalism are compatible, while a majority, 53 percent, say they are at odds. Among Republicans, on the other hand, a full 46 percent say the two are compatible, while only 37 percent say they are at odds. (Not surprisingly, among Tea Partiers a solid majority, 56 percent, say they are compatible.) Finally, 44 percent of white evangelicals say that fully unregulated businesses would act ethically. Add to all of this massive tax-exempt funding of conservative megachurches, as well as the deeply entrenched influence of conservative think tanks, corporate sponsorship, talk radio, the increasingly rightward slant of the mainstream news media, as well as the nonstop agitprop of Fox News, and that’s a heavy thumb on the scales in favor of Christian/conservative/laissez faire values. We’ll see what Frye has to say about this shortly. This entry was posted in Current Events, Religion on June 6, 2011 by Michael Happy.